In some communities, people do not know their police officers. The Haddonfield Police Department decided to have a day to narrow that divide between the police and their community. The department will be hosting Haddonfield Police and Community Day on Saturday, Oct. 31 from 10 a.m. to 3 p.m. at the Borough Hall Lot, 242 Kings Highway East. The event was created as a thank you to the community as well as an opportunity for the community to get to know the local officers. “It is an opportunity for the police department to give back to the community that we serve … It’s a great way to say thank you, come out and meet us, and have a fun day on us,” Corp. Danielle Mueller of the Haddonfield Police Department said. The event was put together by Mueller and officer Briana Catts. It was started for a few reasons, according to Mueller, the first as a “thank you” to the residents, business owners, borough administrators and to the community as a whole. “We have a great group of residents and business district owners who are very supportive of the police. We just want to say ‘thank you’ for all of the hard work and all they do for us,” Mueller said. Another reason was to help shed some light on the job of a police officer. There has been a lot of news around the country putting officers in a negative light, according to Mueller. She hopes through this everyone will realize police officers are people too, and they are here to serve the community in a positive way. The last reason was to create connections so people would feel more inclined to have communications with the Haddonfield Police Department. “We’re here for you. We can help in a lot of matters, and we want to do our job. This gives us an opportunity for us to make those connections with the community,” Mueller said. Haddonfield Police and Community Day will begin with Coffee With A Cop starting at 10 a.m., allowing the community to stop in, have some coffee and breakfast treats from Jersey Java & Tea with the officers and talk about their ideas, concerns and questions. Throughout the day, there will be a bouncy house, bicycle rodeo, basket raffle by local businesses, food, drinks, music and entertainment, all for free. Free giveaways will be available, including balloons, Frisbees, Halloween treats, bicycle helmets and more. There will also be the opportunity to dunk a cop in a dunk tank. Photos can be taken with police, fire and ambulance vehicles that will be on site for the day. There will also be some tips given from the police on identity theft, fraud prevention, Halloween safety and more. The day will continue with other scheduled events such as a karate demonstration by Garaguso Classical Martial Arts at 1 p.m., a K9 demonstration from the Cherry Hill Police Department and basket raffle winners announced at 2 p.m.
Everything during the event is free thanks to donations and sponsorships from the community, borough and business district. Mueller hopes those who attend see how much the officers appreciate the community they work for and that individuals feel the officers are more approachable. “We’d like for people to feel comfortable coming to us or to even just give us a wave when they see us walk by. That is just the kind of friendly community Haddonfield is and the kind of community that we like to protect,” Mueller said. 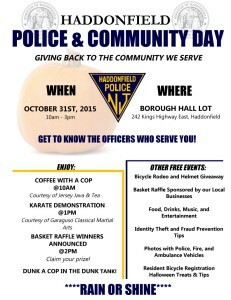 Haddonfield Police and Community Day will be at the Borough Hall Lot from 10 a.m. to 3 p.m., rain or shine. “It’s going to be a really fun day. Free things, great people, if they want to come out and have a lot of fun, there is no reason why they shouldn’t come out,” Mueller said.